A healthy immune system is important. Dr. Dunner only harvest their linden blossom when it first flowers, to retain its potency. 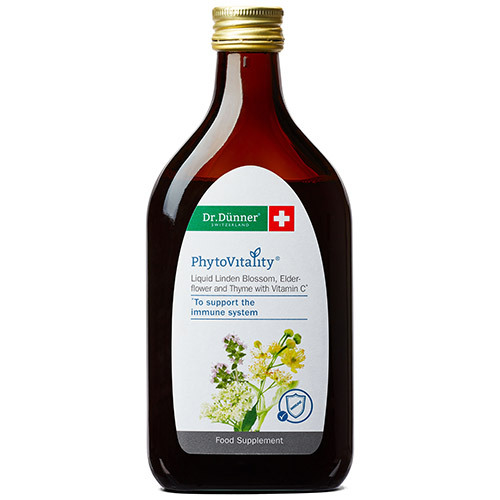 These flowers are then combined with elderflower, thyme and vitamin C, which contributes to normal functioning of the immune system. Finally, the delicious, pure juice of Swiss Baselbiet cherries is added. Dr. Dunner`s orchards create an important habitat for endangered bird species. So you’ll be protecting bird life while your immunity protects you. 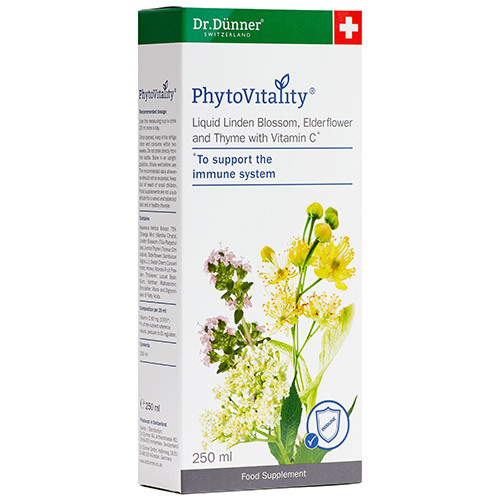 Phytovitality harnesses the powerful, health-supporting properties of plants, the Swiss way. For decades, Dr. Dunner has been handpicking ingredients from the abundant meadows that cocoon their crystalline lakes and scale our sun-drenched, Alpine peaks. Dr. Dunner`s scientists create unique and beautifully balanced blends of nature’s botanicals in small batches, to preserve their potency. The herbal ingredients of these premium products originate mostly in Switzerland. Dr. Dunner use raw materials from certified farms and their growing areas can be found in the UNESCO Entlebuch Organic Biosphere, among other locations. We guarantee the highest purity and quality. The close relationships with their herb growers and the complete control they have over the supply chain guarantees the purity and naturalness of their high quality products. Since 1948, Dr. Dunner has been harnessing the healing properties of organic plants from their home in the alpine Entlebuch, while sourcing the best herbal ingredients from all over the world. These ingredients are combined by hand to create optimal blends that support us in our daily lives. Aqueous Herbal Extract 75% (Orange Mint [Mentha Citrata], Linden Blossom [Tilia Platyphyllos], Lemon Thyme [Thymus Citriodora], Elderflower [Sambucus Nigra L.]); Sweet Cherry Concentrate, Honey, Acerola Fruit Powder, Thickener: Locust Bean Gum, Xanthan; Maltodextrin, Emulsifier: Mono- and Diglycerides of Fatty Acids. Use the measuring cup to drink 20ml once a day. Once opened, keep in the refrigerator and consume within two weeks. The recommended daily allowance should not be exceeded. Below are reviews of Dr. Dunner PhytoVitality - Linden Blossom - 250ml by bodykind customers. If you have tried this product we'd love to hear what you think so please leave a review.